It’s Christmas in Neopia and you can feel the excitement in the air. Shops are stocking seasonal goodies, pets are bundling up in their finest seasonal wear, and people are excitedly visiting the advent calendar. It truly is Christmas in Neopia. With the advent calendar and optimistic attitude held by most Neopians, Christmas truly is one of the greatest parts of the year. As a child who struggled to save neopoints, the advent calendar was like a breath of fresh air. As an adult, it reminds me of years gone by and is a little extra excitement in the lead up to Christmas. 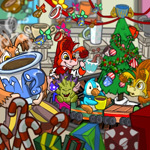 There is one problem with the Christmas season on Neopets; it is one of the busiest times of the year for many people. Never fear, however, as I have pondered some of the time-related problems that many may run into over the holiday season and brainstormed solutions. For many Neopians, the advent calendar is the highlight of the year. Unfortunately, the business of the season brings difficulties for many. Vacations were the problem I encountered the most growing up when it came to Neopets. While I always managed to get the first few advent calendar prizes, my parents would drag me from the computer to go on vacation, even if I emphatically pleaded and explained why I desperately needed to have access to Neopets. Apparently the advent calendar didn’t mean nearly as much to my parents as it did to me. While Neopets isn’t fully functional on mobile, you should be able to check the Advent Calendar from a mobile or tablet. If you don’t have access to the internet, you can probably find free wifi somewhere. When visitors are around it can get difficult to spend as much time as one would like online, especially on Neopets. Thankfully, the advent calendar takes very little time and can ordinarily be accessed from your mobile phone in a pinch. A Neopian’s shop I often very important to them, but a shop can be ridiculously time consuming. Between restocking and pricing, it can all take a lot of time. The key to keeping your shop all stocked up in busy times is to prepare ahead. If you’re going away, you might not have regular access to Neopets. Make sure that your store is fully stocked before you leave, and hopefully it will last your time away. Consider pricing your items slightly higher than you ordinarily will, as this will likely keep your store from being empty so soon. If you think that you will be able to get online occasionally, consider spending a bit longer gathering items for your store before you leave. Stock up on extra items for your store so that you can quickly price them and add them to your store. Another option is to buy multiples of items so that you won’t have to price items as often when stocking your store. Like going away, visitors can often mean you don’t have the time to regularly update your store. Prepare ahead so that all you really have to do is price your items, like if you were going on vacation. Another option is to pre-price your items. After buying things for your store, make a list and work out what you will be pricing your stock at. It may not be as accurate if you did it as you were adding the items to your store, but it will certainly save you a lot of time. Games are a great part of Neopets, but it can be difficult to spend time playing them when life gets a little too busy. Unfortunately for some phone users, flash isn’t available on their phone, so this makes playing games a little more difficult. If you don’t have computer access, you will probably have a lot of trouble playing many of the games you often stick with on Neopets. Be sure to install Ghoul Catchers on your phone and play it whenever you have some downtime. You can quickly earn significant amounts of neopoints, so you should definitely be sure to consider it to earn money. Remember to quickly log in to the site and bank the money you have earned each day. If you still want more of a game fix, consider playing some of the non-flash games on your phone, like Pyramids and Cheat. If you do have access to a computer, you are probably going to have to sacrifice some precious play time. If you usually have specific goals with your games each month, consider relaxing them as you may not have the time you usually would. Don’t worry about the games you aren’t the best at but focus on the games that you can easily and quickly get a score that will earn you 1000NP per play from. If you have plenty of visitors around, you will probably have to revaluate your goals and expectations. You’re probably not going to have time to play all the games you would usually play, but you may have time to pop in and play a few rounds of a few games. Consider following the advice given above. If you’re going away, you’re probably not going to have the time, or ability, to work towards any new Avatars or trophies. Be sure to collect the Christmas ones, if you haven’t already received them, but relax other than that – you’re on vacation! As for trophies, consider playing for them early in the month, when you have a chance, but don’t beat yourself up over it. It’s the holidays, so a new shiny trophy isn’t the most important thing right now. There are some things that you can do to make the most of Neopets even while celebrating the holidays. Prepare ahead: buy extra stock for your store and consider pricing them in advance. Update people: let your guild, mall, and friends know if you’re not going to be online, especially if your guild or mall has activity requirements. Jeran sat slumped over the throne. Before him, Meridellians and Darigans commemorated the fifth year of peace since the war, a peace that would last a thousand years. They spoke and danced under azure faerie light, alongside the finest music Meridell had to offer. Odors of baked goods, exotic fruits, and well-done meats saturated the air. Hi everyone! I’m a web designer thanks to Neopets. I started making user lookups way back in 2004 using Jenny’s Darkest Faerie Lair tutorials (anyone else remember Jenny way back in the early 2000’s?) and couldn’t stop. I kept creating guild layouts for people on the guild boards like crazy using paint. PAINT! People loved it. Then I got into Photoshop Elements, and after took graphic design classes. All around everything on the web started because of good ‘ol Neo.